Yellow sapphire gemstone is also called pukhraj in Hindi. In Sanskrit it is called Guru ratna, Pushparaag and in Persian as Yakkot. In Urdu as Asphar. It is basically a Corundum and comes in many other colours. It has the power to subside excess of vayu, pitta and kapha (the tridosa theory in ayurveda). The chemical composition is Aluminium Oxide with a formula of Al203. It is mainly found in Queensland and New south Wales in Australia. Even Sri Lanka, East Africa also produces this type of sapphire. It has hardness of 9, specific gravity 4.00, refractive index 1.76-1,77 with a Trigonal crystal structure. Who should wear Yellow Sapphire ? a) It can be worn by the persons born in Aries, Cancer, Scorpio, Sagittarius and Pisces, if Jupiter is weak but well placed. b) Jupiter is a planet karak for eduction , marriage and ability to comprehend. Persons engaged in teaching, education, law, administration of justice, MPs, MLAs, judges, public leaders, gazetted officials, vice chancellors, chairmen of public bodies, secretaries, legal luminaries, administrators, big linancers and high priests may be benefited by wearing it. c) It will prove useful and beneficial to those in whose chart Jupiter is lord of auspicious houses, lord of 1st , 5th or 9th house. It will prove beneficial to limited scale in case of Leo, Scorpio Lagna. d) In case where Jupiter is in Hamsa Yoga, the gem gives special good results. e) In cases where Jupiter in addition to being lord of Trika house (6th , 8th and 12th house) is also lord of a trine, wearing of it, neutralize the ill effects of Trika house. f)	Those in jobs connected with banking and revenue services, money lending, accountancy, auditing, writing, publishing or sales of books, poets, scholar, priest, religious teachers, monks should wear it. Substitutes: Topaz is the substitute but it should always be worn of double the weight. 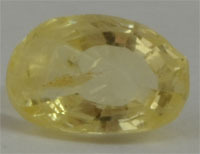 Citrine or Hakeek may also be used in its place. How to wear Pukhraj ? It is usually worn in the first finger of the right hand. It must be worn in gold ring in the index finger on Thursday morning after purification. It can be worn in early morning when Punarvasu, Poorva Bhadrapada or Vishakha Nakshatras are operative and there is no Bhadra. Blue colour cuts the yellow colour and vice versa. It means that the negative influence of Saturn can be nullified by wearing it and the adverse results of Jupiter can be counter balanced by blue sapphire. So if Jupiter is adversely placed and emits negative vibrations on the native, blue sapphire can be used whereas if Saturn is adverse it will be of immense benefit. However, use this when Jupiter is weak or afflicted but well placed. It reduce the adversity caused by Mars, Mercury, Saturn and Venus. However, it cannot counteract (he evil vibration of the Sun and Moon. Unmarried girls who are facing obstacles in the finalization of marriage may wear Indian coral of 14 rattis of weight along with this stone of 7 rattis of weight, if they are not mangli and Jupiter is afflicted, weak retrograde of debilitated but that is not placed in trikas. Yellow sapphire can be worn along with Red Coral, pearl and ruby. It should not be worn with diamond and blue sapphire. 1. It harmonizes and benefits Guru or Jupiter, the largest graha (planet) in the solar system. It is benefic planet and Pukhraj is also a benefic stone, it never gives negative effect unlike blue sapphire. 2. It signifies knowledge, wisdom, virtue, fortune, justice, education, future, religion, philosophy, devotion, children, distant travel, spirituality, truthfulness, prosperity and charity in our horoscoe, therefore wearing it improves these characterstics. 3. Guru is the major instructor or teacher and influences action with the highest order and balance. 4. It helps in increasing memory and learning. 5. It is also an effective stone to decrease the effects of snakebite. 6. It's use brings about affection and harmonious relations amongst family members . 7. The reputation of the person increases day by day and one is respected everywhere. 8. It is for security, wealth and general prosperity. 9. It helps with academic pursuits, business and trade. 10. It also brings stability in marriage and happiness from children. 11. It helps in gain weight. 12 . It is recommended for economic prosperity and comforts and is particularly good fo those engaged in business or industry. Astroshastra presents different varieties of Pukhraj Birthstone for our esteemeed customers to suit their needs. Do check our Gems sales for some best lowest priced Gemstones. It has miraculous healing power. It cures rheumatoid arthritis, degenerative arthritis, gout, sciatica, lumbago, rheumatism spondylitis, heat troubles, high blood pressure, stomach ailments, impotency, frigidity and sterility. It is very useful in prevention of obstacles of childbirth. People suffering from any types of cancer, diabetes, kidney/ gallstone, insanity, tumors, hernia, pleurisy, appendicitis, meningitis, carbuncle, piles, pancreatic troubles should also wear this gem. It helps balancing stomach, gall bladder, spleen, and liver. It helps tackle weakness, shivering feelings, and catarct. It is also said to help heal leprosy and skin diseases. Actual Pukhraj should feel heavy when put on one's palm. It should not have layered surface. After being nibbed with a touchstone, it should shine further. A defective or fake piece will give sand like roughness when touched. It can have blackish bubbles in its body. A fake will give different hues of yellow and whitish. A real sapphire would drown in a liquid whereas other fakes will ultimately come to the surface. It is the precious stone for Jupiter.